Every year over 45,000 people are diagnosed with lung cancer in the UK, accounting for 13% of all new cancer diagnoses and it’s the 3rd most common cancer, and the most common cause of cancer death. It is believed that nearly 90% of all lung cancer cases could have been prevented, as lifestyle factors make a huge difference to this disease, proved by the fact that it is the over75s who are typically affected, largely thanks to the tobacco smoking culture. (Statistics courtesy of Cancer Research UK.) However being told it could have been prevented isn’t particularly helpful to know if you have already been diagnosed so read on to find out about the most common forms of treatment for this disease. First of all, your treatment plan will depend on whether you have non-small-cell lung cancer or small-cell lung cancer. Approximately 90% of all diagnosed lung cancer cases are non-small-cell lung cancer which is slow growing and usually found in the outer area of the lung. Occurring most commonly in smokers, it is also the most common form of lung cancer in non-smokers too. 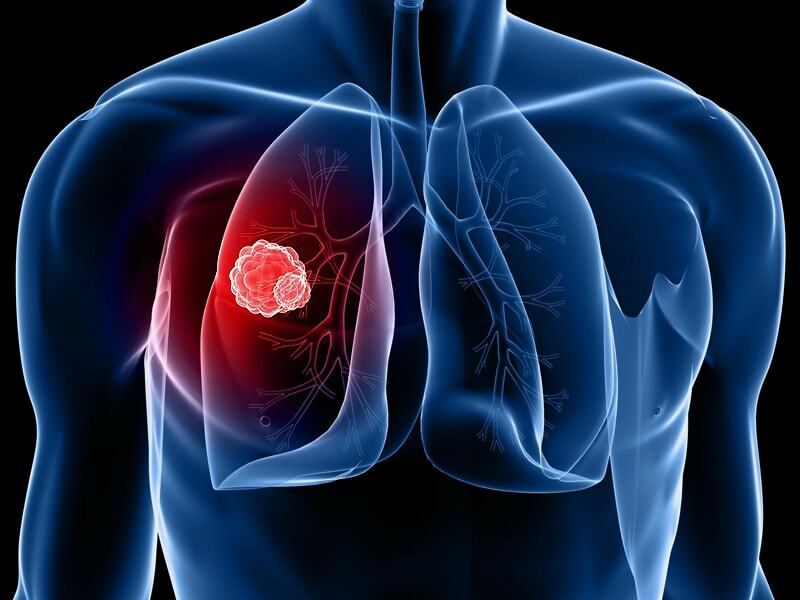 Small-cell lung cancer normally occurs in the middle of the lung and grows much more rapidly. Cases are extremely rare in non-smokers. Starting with the most common form the non-small-cell lung cancer, treatment for this is can be chemotherapy, radiotherapy, surgery or a combination of these depending on at what stage the cancer has been diagnosed. If you have early stage, you are most likely to be prescribed a treatment of chemotherapy followed by radiotherapy which is called adjuvant radiotherapy. These 2 in conjunction can help slow and shrink the tumour, or in some cases even completely eliminate it. Since this cancer often spreads to the brain, radiotherapy to the brain is often administered too. Surgery is usually performed to get rid of the cancerous lung cells in non-small-cell cancer if possible. Often some of the lymph nodes are removed to and sent out for analysis to check for any cancerous cells too. Surgery tends to be performed in cases of this cancer where it is near to the heart, major blood vessels and the food or wind pipes. While this is daunting, your breathing should not be altered by this drastic-sounding operation and surgeons are even able to remove up to one lung without altering your breathing. Since small-cell lung cancer has generally already spread by the time that it is detected, surgery isn’t normally used to treat it. Chemotherapy and radiotherapy are both used to shrink and slow down the tumour, as well as other treatments to relive and control the symptoms. However for very early stage small-cell cancer that has not yet spread to the lymph nodes found in the middle of the chest, a lobectomy can be performed which is removal of one lobe of the lung. Lung treatment is usually carried out fairly rapidly following diagnosis as since with most if not all cancers, time is an important factor as the earlier its caught, the easier it is to treat. With private cancer clinics or if your consultant recommends you, there are clinical trials that place too. Check out the Cancer Research Site above to see if you are eligible to get involved too. For more information about lung cancer treatment, visit the NHS website. Abbie Owens is a progressive promoter in all things related to health and wellbeing. Currently studying Health Policy and Management at the University of Exeter and is the creator and main contributor to the Think Healthy Magazine.